Damiana is bright and beautiful! I love damiana, you guys. It is seriously one of my favorite herbal allies, and definitely my favorite aphrodisiac. Damiana brings a spicy, floral, woody flavor to everything you add it to, and the red hue it lends to teas and to honey is absolutely heartwarming. If Damiana were in human form before you now, she’d be a courtesan – eyes agleam with a deep sparkle in dark irises, heavy breasts like ripe fruit, with wide hips and large thighs. Her skin would be a soft brown, and her dark hair would catch the light with amazing glints of red. Her mouth would be perfect for eating plums, her fingertips light and sensually beckoning you closer, with laughter and passion in her eyes. 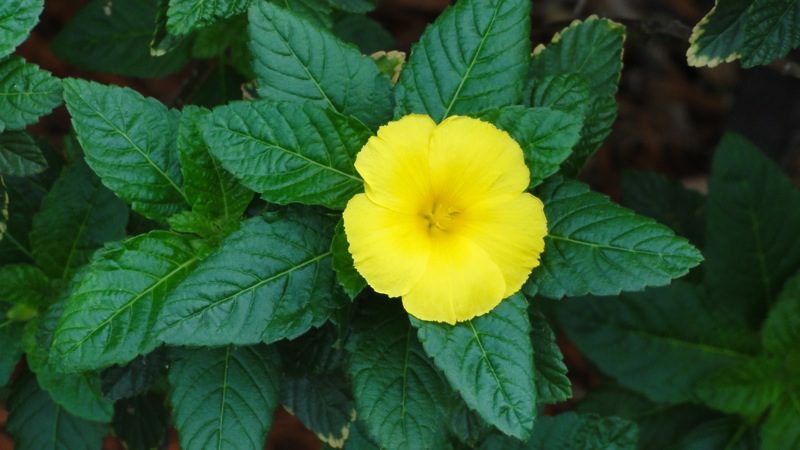 The Latin name of this delightful plant is Turnera diffusa. She’s a member of the passionflower family, and is that any surprise? 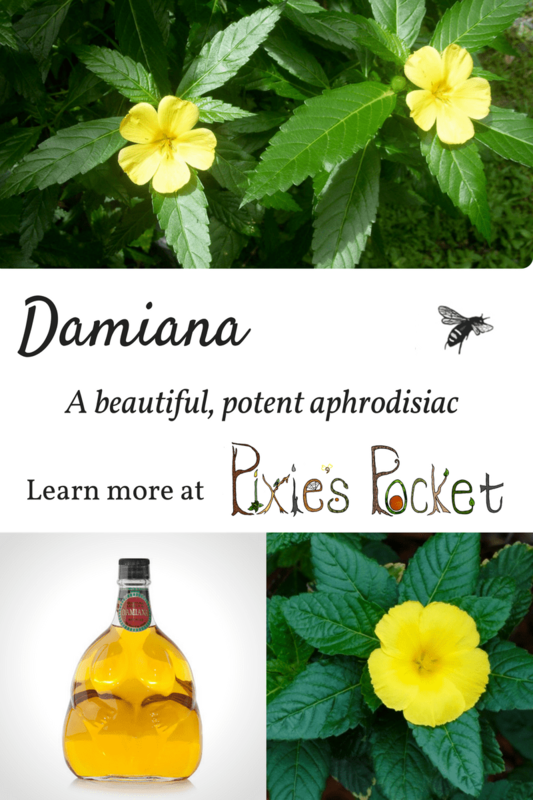 Damiana is the first herb in the pot when I brew up my aphrodisiac honey blend, Bunny Hunny. She is the main ingredient in my naughty Love Cordial. My giggle joins in with her luscious laughter as she scents up my home with her red-tinged magic. Find Damiana liqueur at your local booze vendor! Damiana is renowned for her aphrodisiac properties but is also used as an antidepressant, an anti-anxiety treatment, a tonic, a diuretic, a cough-suppressant, and a mild laxative. She should not be used during pregnancy, as there are abortive qualities in the muscle contractions she encourages. If you are someone with diabetes or hypoglycemia, use damiana with caution. Damiana finds her way into my herbal smoking blends, mulled wine, and any cordial meant to entice the senses and stir the cauldron of desire. If you want to play with Damiana on your own, here is a few sources to buy dried and cut herbs. I’ve not tried propagating a live plant, and I hear that true Damiana live plants are hard to get outside of Mexico! Your local herb market or herbal pharmacy!